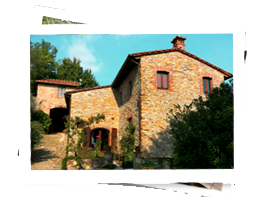 The walls around the city of Lucca, Tuscany are about 2.5 miles long. 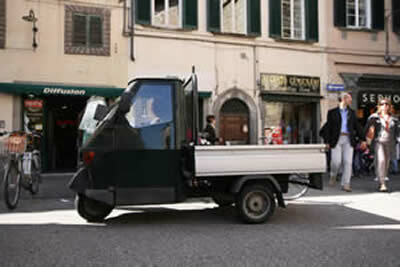 Most of it is closed to automobile traffic, so the locals stroll or ride bikes everywhere. 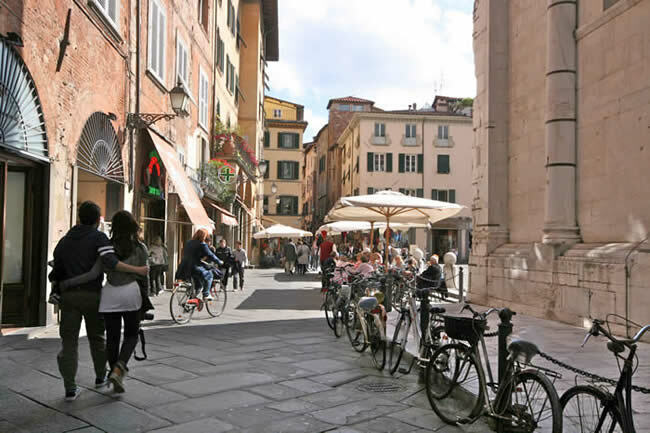 Here's a typical scene, people strolling, people on bikes, lots of people hanging out at coffee shops on a piazza. The traditional bike is a one-speed, preferably with basket for shopping, and if you have children, a bike seat in back so you can pedal them to school. 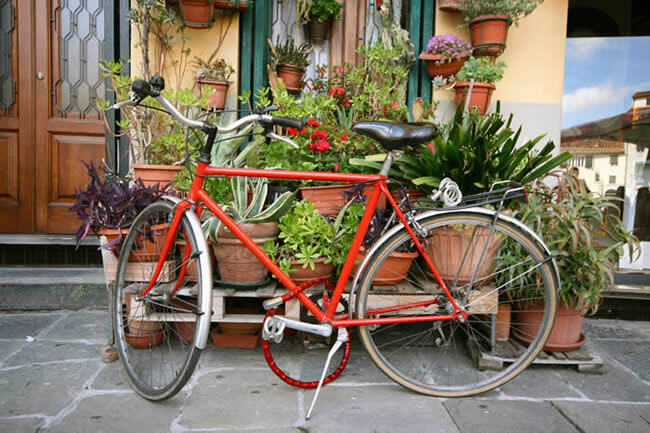 This is much fancier than a typical Lucca bike, but I liked the scene anyway, so I snapped a photo. This is in the old Roman amphitheater, now an oval shapped piazza. You can see the reflection of the other side of the piazza in the window to the right here. 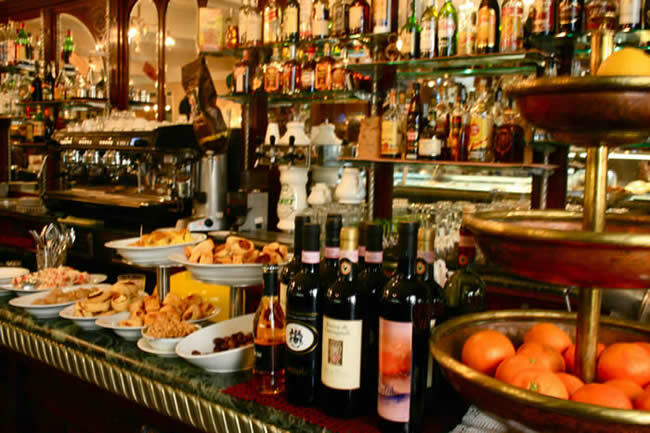 This is the bar at a very nice coffee shop.... not just coffee.... you can also order an aperitivo, which is a light alchoholic drink that the Italians might have in the afternoon. 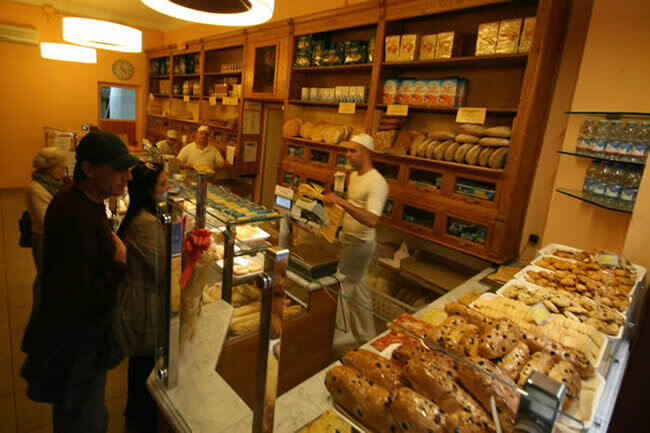 Many coffee shops make their own pastries. 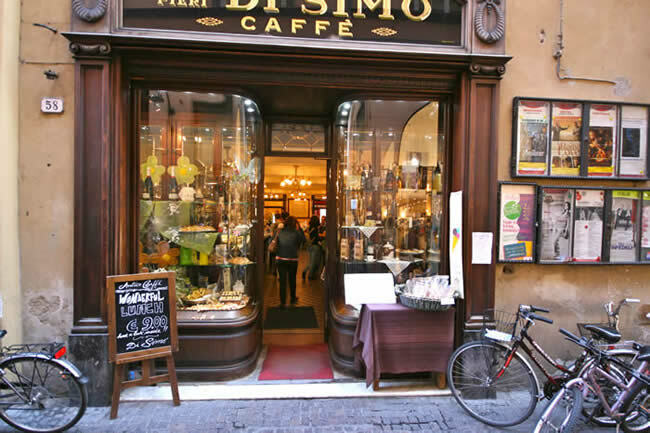 The classic Italian breakfast is a cappucino and a pastry, eaten standing up at the bar with a friend, then quickly you go off about your business for the day. There are many many little shops lining the streets. When I say little, I mean that every shop is one room, and sells one thing. 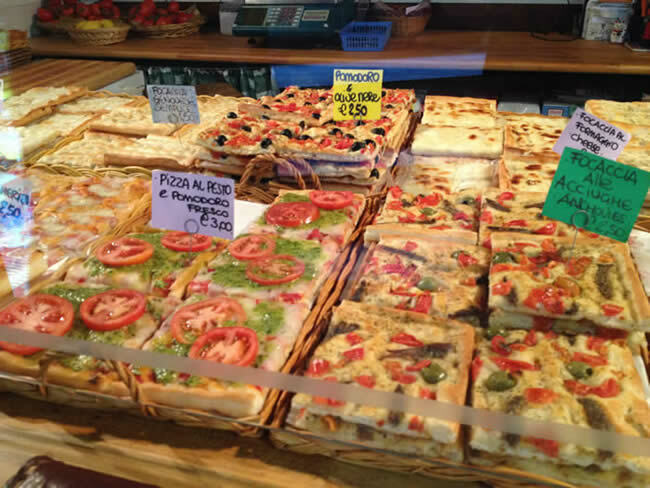 The food shops are amazing. 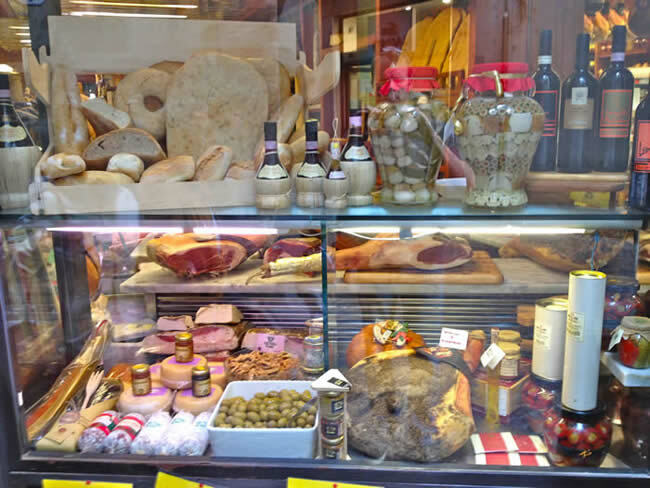 This is a typical little shop selling fine foods, like prosciutto, breads, olives, honey, stuffed peppers. 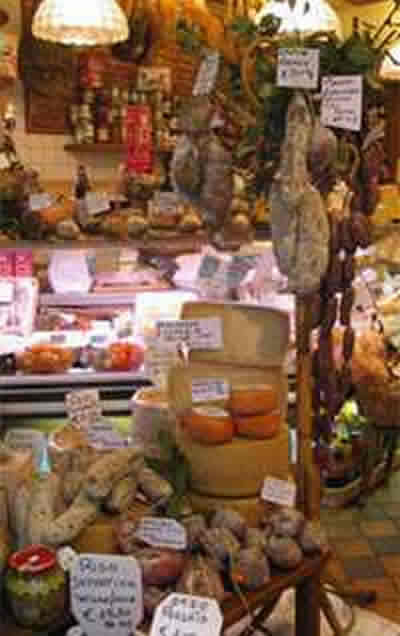 In this particular shop you can also, in season, buy a fresh truffle -- he keeps them hidden behind the counter, and they are sold, wrapped in a fig leaf. 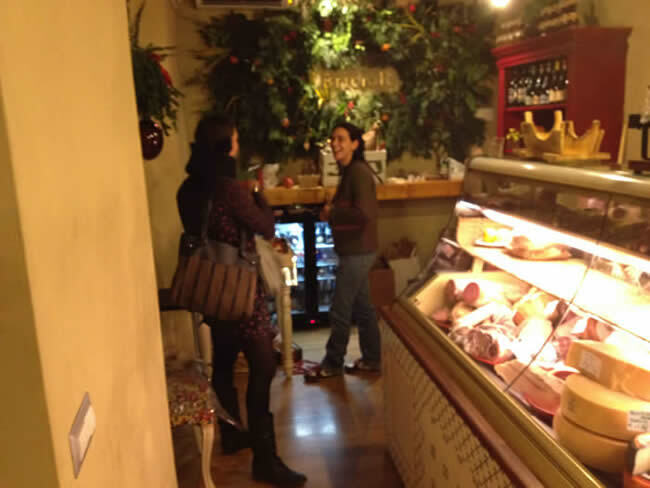 Another shop. The displays are really gorgeous. Don't forget the wine!!!!!!!! 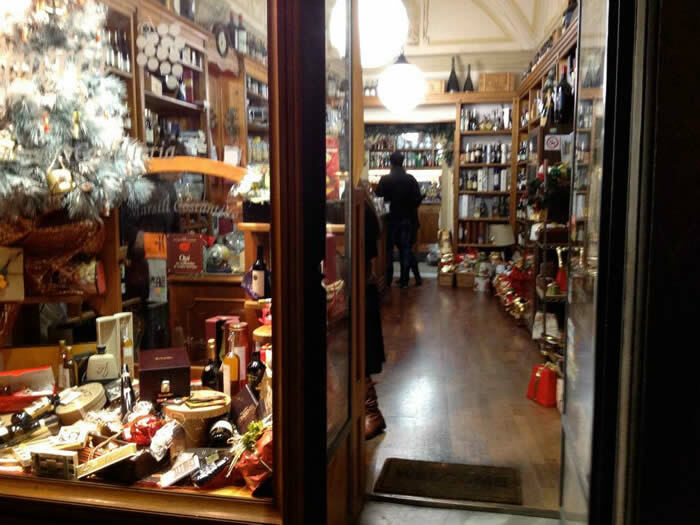 My favorite wine shop (different than this one), has a huge cantina under the streets of Lucca, originally Roman and dating from the year 100a.d. 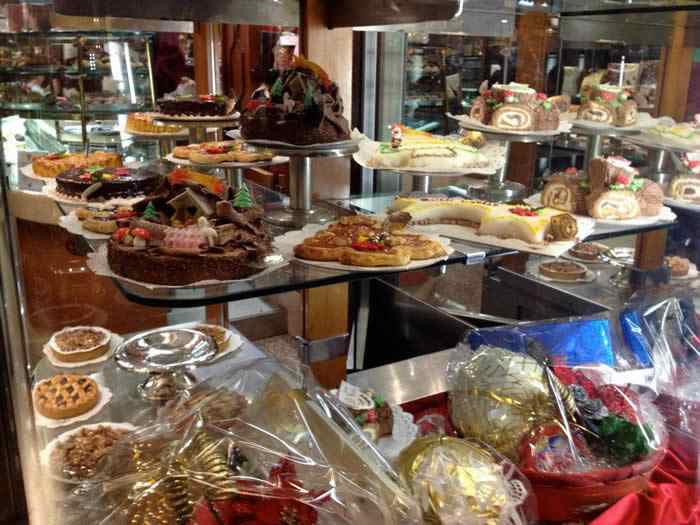 There are many bakeries in town. This one is really good and in the morning you take a number because there is a crowd around the counter. Don't forget the flowers!! 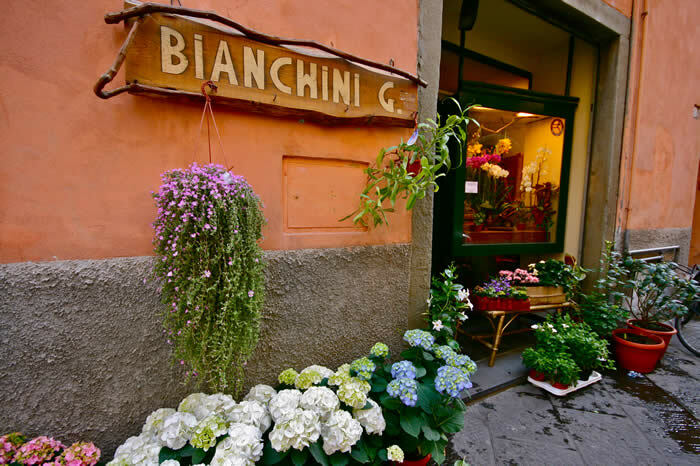 This one-room florist is just across the street from the door to my personal apartment in Lucca. There is usually a cat sleeping on the bench.